Poen Van Zyl of Zambeze Delta Safaris was standing 15 feet above me atop a vegetation-strewn termite mound surveying the abandoned garden through a well used pair of binoculars. 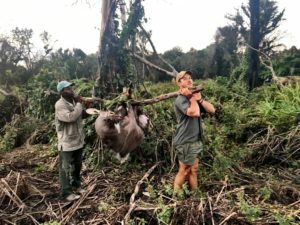 The local tribesmen that call the famed Coutada 11 of Mozambique home practice slash and burn farming, clearing enormous areas in the forest and then abandoning those areas after one or two years of use. The forest was quickly reclaiming the area with vegetation, and the constant hum of tens of thousands of bees signaled that many of the plants in the area were flowering. It was mid-July and the weather had been unseasonably cool and wet, but had turned warm and humid, typical for winter in costal Mozambique. In addition to bees, the local antelope also visit these abandoned gardens. We were looking for an old mature bull Nyala that Poen knew frequented this particular garden. The unmistakable trumpet of an elephant rang out and Will Fawcett and I locked eyes. 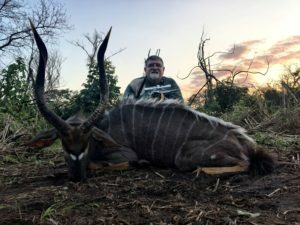 In addition to being a friend, Will is a professional hunter with Numzaan Safaris in South Africa and joined me as an observer on this safari in Mozambique. The details of this adventure had been made at the 2016 Safari Club International (SCI) Convention in Las Vegas. 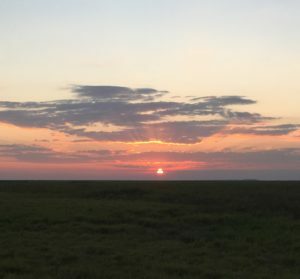 The plan had been for Will and me to hunt in Mozambique for two weeks, then fly back from Beira, Mozambique to Johannesburg, drive down to the Freestate to pick up a couple of species I had missed on my first safari to R.S.A. in 2014, and then finish the trip with a couple of days in Limpopo. Will and I smiled at one another nervously. Elephants in the area could spell trouble and that elephant sounded close. The elephants in Mozambique are survivors of several civil wars and are not particularly fond of humans. In fact, one could say they are downright aggressive. I imagined a scenario in which we found the old bull about the same time that the elephants ambled into the garden. I tend to have that kind of luck. To compound the problem, I was the only person with a firearm, and it was a revolver. I had absolutely no interest in trying to turn an angry charge with a revolver. Poen looked down and waved Will up. Will labored up the termite mound and then Poen and he whispered and pointed while they formed a plan. From the ground out of earshot, I took the planning as a good sign. Perhaps the old bull was in the garden. After an eternity while I watched the afternoon sun inexorably dip toward the western horizon, Will and Poen came down to my level and laid out the plan. There were five bulls in the garden. The closest one was immature and alone. Several dozen yards deeper into the garden were three mature, but young bulls. All three of them were shooters, but none of them were the “proper” bull. The old man we were after was about 150 or so yards from us, close to the edge of the garden where it disappears into the forest. To compound our problems, the elephants were close and would not tolerate our presence in the garden and the sun was very low in the western sky. “Perfect,” I thought. As quietly as possible, we began to move toward the old bull trying desperately to skirt around the younger bulls as not to alert the old bull to our presence. Luckily, baboons frequent these gardens as well, and the noise that stalking hunters make pales in comparison to the noise a troop of hungry baboons can produce. Despite our best efforts, the immature bull spotted us and sounded the alarm. The older group of three bulls began to move away from our location and, unfortunately, we had lost sight of the oldest bull as we began the stalk. With faith as our only indication that the old bull was still in the area, we stuck to our plan and moved forward. Suddenly, Poen’s tracker, Gotchi (pronounced goat-chee and meaning piglet in Zulu) froze. Through years of hunting as a pair, Gotchi and Poen communicated with no words exchanged. Gotchi set up my shooting sticks and Poen slid to a position just to the right of them. Poen’s tone was urgent. “He’s right there. No more than 70-80 yards.” The big old bull turned his head and the motion caught my eye. His old gray coat blended in perfectly with the surroundings. “Got him.” I put the Freedom Arms Model 83 chambered in .454 Casull onto the cradle in the shooting sticks and looked through the scope. I had set the scope on it’s lowest power knowing through hard experience that spot and stalk hunting with a pistol is nigh on impossible with anything but the lowest power settings. I kept both eyes open and looked past the scope at the bull, aligning the pistol with him as to have any chance of seeing him through the scope. The crosshairs settled on his left shoulder, but he was facing away and the angle was severe. This was not a good shot and certainly not one I was going to take. Time ticked by as the sun marched further to the west. I kept the pistol aimed at the bull but kept both eyes open as not to get eye strain waiting on him to turn. Clearly, he was not concerned by the closeness of the elephants or the setting sun. Neither was he concerned about the long walk we would have through the forest to get to the clearing where we had left Poen’s truck an hour before. Finally, the old bull turned presenting me with an excellent slightly angled shot on his left shoulder. I cocked the single action pistol, aligned the crosshairs, settled my breath, and began to squeeze the trigger. The recoil from the .454 Casull is substantial, and one can easily jerk the trigger in anticipation of the crushing recoil that follows the shot. The only cure for this is practice, and a lot of it. The revolver roared to life and I heard the unmistakable smack of the Hornady 300 grain XTP-MAG as it connected. He trotted a few yards away, and I was able to put a second shot into his right shoulder. After receiving the second shot, he tried to escape to the relative safety of the invading forest, but fortunately, did not make it. He measured 74 1/8” and ranked number 6 with a handgun in the SCI Record Book. To say I had amazing success in Mozambique would be a vast understatement. In Coutada 11, I harvested seven SCI Top-10 species with handguns (Common Nyala, number 6; Lichtenstein Hartebeest, number 7; Chobe Bushbuck, number 7; Natal Red Duiker, number 6; and Blue Duiker, number 5, as well as the new potential number 18 overall Livingstone Suni, which should rank number 5 with a handgun when certified by a SCI master measurer.